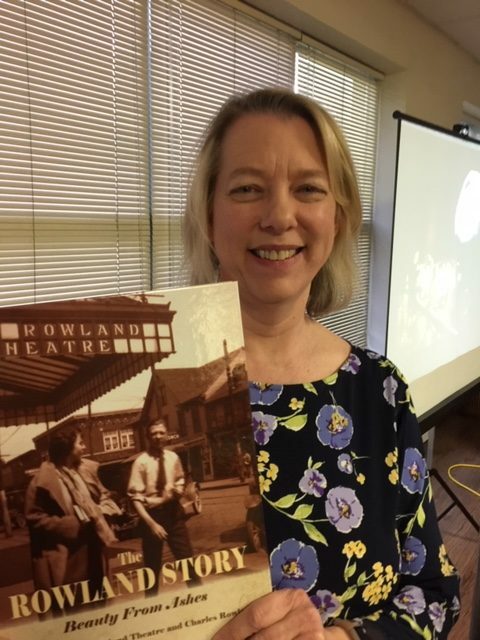 CLEARFIELD – The Clearfield Area Branch of AAUW opened its series of Wednesday Book Talks at the Joseph & Elizabeth Shaw Public Library with a presentation by local author Rebecca Inlow. Inlow, who is on the board of directors for the Rowland Theatre in Philipsburg, has written a book detailing the history of that landmark theater. Titled The Rowland Story: Beauty from Ashes, the book recounts not only the history of the theater, but also the life of its founder, Charles Rowland. Charles Rowland moved to Houtzdale in 1874 at the age of 13. He was an enterprising young man, making his fortune in coal mining and railroading. Rowland went on to become a U.S. Congressman, serving from 1815-1819. But his lasting legacy is the theater, which bears his name. Construction for the Rowland Theatre, which was designed for silent movies and stage shows, began in 1916. It was built in Philipsburg’s downtown area on the site of the Pierce Opera House, which had been destroyed in a fire in 1910. The theater opened on June 4, 1917 and went on to serve the community for many years. The Rowland family retained ownership until 1978 when the theater was closed as the once glorious Rowland was in very bad shape. The building was purchased by a Chester Hill resident who began the work of repairing and restoring the theater. Reopening in 1981, it closed nine months later and was put up for sheriff sale. Once again members of the community rallied. The non-profit corporation Rowland Theatre Inc. was formed. Its board of directors, of which Inlow is a member, works tirelessly, and the theater is now restored to its former glory. Open 364 days per year, The Rowland continues to fill its place in the community, providing a home for movies and live shows. Inlow noted that one such special show, featuring the Paragon Rag Time Orchestra, is coming to the Rowland Theatre on Saturday, May 11, 2019. This group, which will be performing from the pit orchestra in front of the stage, plays music from silent films. The occasion provides an opportunity to experience firsthand those early days of silent films at the Rowland. Sales of Inlow’s book The Rowland Story: Beauty from Ashes benefit the Rowland Theatre. Copies may be purchased at the theater. The Wednesday Book Talks continue on Wednesday, March 27 with a luncheon tea at 1 p.m. at Shaw Public Library. Clarington, Pa., author Andrea Zug will be featured. She is the author of the Lancer Inc. detective series. A self-proclaimed people watcher, Zug finds material for her mysteries from her people-watching. Reservations for the program may be placed at the front desk of Shaw Public Library or by calling 814-765-3271 by Monday, March 25 at 5 p.m. A donation of $5 for the meal is requested. Proceeds benefit the local AAUW’s Delayed Studies scholarship. The final Wednesday Book Talk will feature DuBois author Kristine Gasbarre on Wednesday, April 3 at 1 p.m. Luncheon will be served that day as well with a $5 donation and reservations requested.